Does Twitter want to build a tweet-controlled drone? 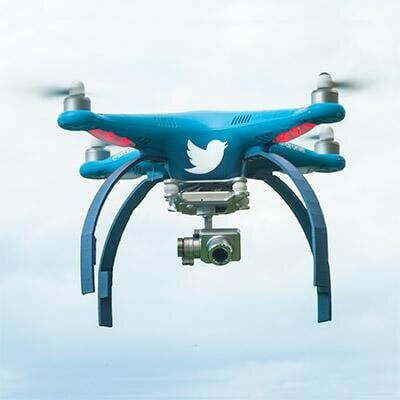 Twitter wants to get into drones. At least, that’s what a recently revealed patent from the company appears to suggest. Is a Twitter drone in the works? Controlling a drone with tweets? The folks at the Federal Aviation Administration (FAA) will surely have palpitations at the prospect of such functionality. Reading on, there’s more for the FAA to worry about, as Twitter suggests the drone could be controlled “through democratic means,” a feature that on the face of it sounds like the flying machine would take ages to go anywhere or do anything. And when the controllers do finally agree on a set of actions, who knows what the consequences could be. When NBC asked Twitter what on earth the patent was all about, they came back with: “Two words: drone selfies.” Interesting considering the word “selfie” isn’t mentioned once in the patent. However, it does mention photos and video clips captured by a drone being placed in messages “broadcast by an account associated with the UAV,” adding that video footage from the camera could be “live-streamed in a card-type message.” That kinda ties in with Periscope, the live-streaming service acquired by Twitter in early 2015. If you fancy trawling through the details of Twitter’s USPTO filing, you can check it out here.